A walk through central Amsterdam is like a visit to a huge outdoor museum. Not surpringly, the vast majority of centuries-old houses are listed — and protected — as national monuments. These picturesque houses at Kattenburgerplein hide a secret. The reason is simple: though they look like many of the other historical buildings in the city, the houses at this square were built in 1970. Yes, Nineteen-hundred-seventy. Kattenburg is one of the three Oostelijke Eilanden — literally: “Eastern Islands” — which the growing city built during the second half of the 17th century, in the IJ river. To a large extend this is still the case. 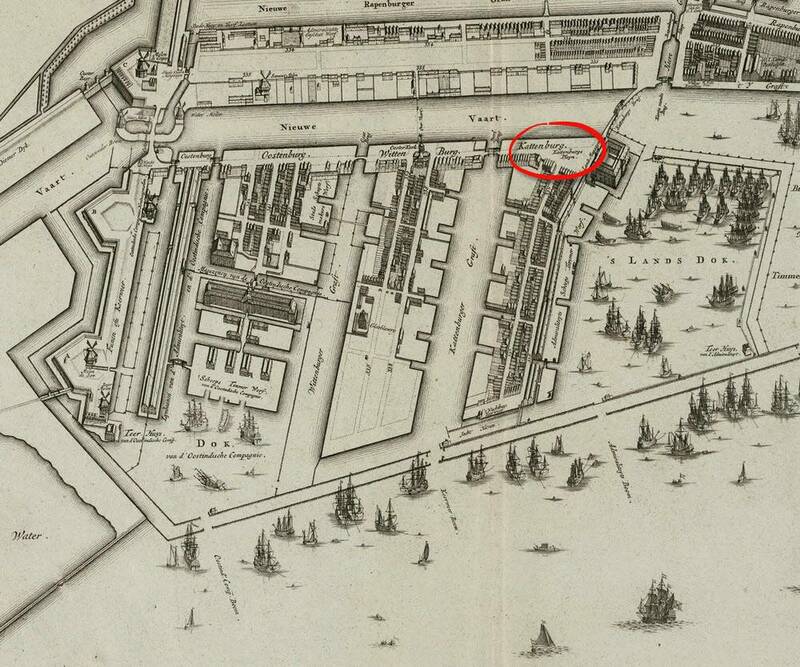 Due to their proximity to the IJ, which at that time was the port of Amsterdam, the islands were home to many shipyards and related businesses — though Kattenburg4 was earmarked for residential buildings only. Oostenburg was for private wharfs and yards, and Kattenburg was home to the navy and its shipyards. Kattenburg is the site of a building then used as an admiralty warehouse, and which currrently houses the National Maritime Museum. As the city’s fortunes changed, working-class areas took a heavy toll. The advent of steamships, and the resulting move of shipyards to Amsterdam-North and the Eastern Docklands greatly contributed to the deterioration of work- and living conditions on Kattenburg and the other islands. 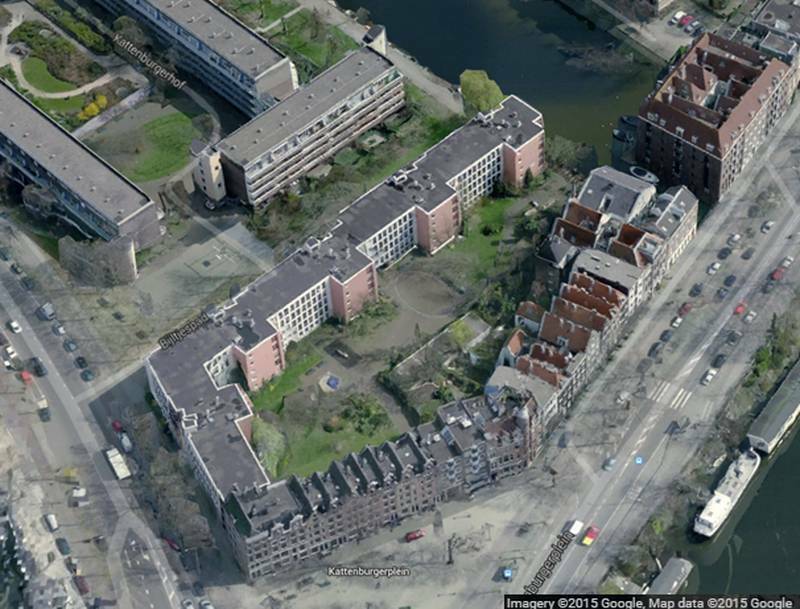 So much so that in between the two world wars Kattenburg was considered to be the worst slum in Amsterdam. Many of its houses were so far gone that they were demolished during the Second World War6, and in 1953 the city council gave the green light for a rigorous reconstruction plan. The plan called for a total destruction of the old infrastructure, which was to be replaced by modern apartment buildings set along a new street grid. It was a huge production. Some 1400 families had to be moved elsewhere. And that’s what happened at Kattenburgerplein 52-89. The row of houses facing the square (which, by the way, is in the shape of a triangle) was built between 1968 and 1970. Most of the doors along the façade do not open. It is very much a façade that hides a series of student flats built of concrete. Most of the doors you see can not even be opened. In other words, what looks like a row of well-preserved, 17th-century houses is, in fact, fake. That said, architect Pieter Pals — of the erstwhile Bureau Monumentenzorg (‘Monument Care’) — in his design used photos of houses that had been situated near this spot. Some of the gables came from houses demolished elsewhere on Kattenburg. Interestingly, the historicism of the façade at Kattenburgerplein was criticized almost as much as the unsparing transformation of the islands. It was not just the functionalistic new architecture, or the completely revised pattern of streets. The families displayed by the entire renewal project were promised that they would be able to return to their island. But after their old homes were demolished, the property — eagerly eyed by investors and developers — became too expensive for the planned social, rent-controlled housing. A big struggle ensued between all parties involved. Returning families were enraged at the raised rents. There were demonstrations in The Hague, the Netherlands Seat of Government. Squatters took over a model home. The offices of a housing corporation were occupied. In the end, the islanders — most of whom returned to Kattenburg — prevailed. While the metro was eventually built, plans for a highway — which would have resulted in the destruction of even more houses in that district — were abandoned shortly after the 1975 riots. But the experience gained at Kattenburg, together with the Nieuwmarkt debacle, meant that such popular districts as De Pijp and De Jordaan were largely spared the kind of city forming and functionalism that took such a heavy toll on the ‘look and feel’ — as well as the citizens — of the Oostelijke Eilanden. ‘Largely,’ because after all, a walk through the Jordaan does reveal many apartment buildings from the 1980’s and early 90’s that are completely out of character with the rest of the neighborhood. Nowadays the city, kept in check by laws, regulations — and even UNESCO World Heritage rules — is a lot more conservative and sensitive in its approach to urban renewal projects. 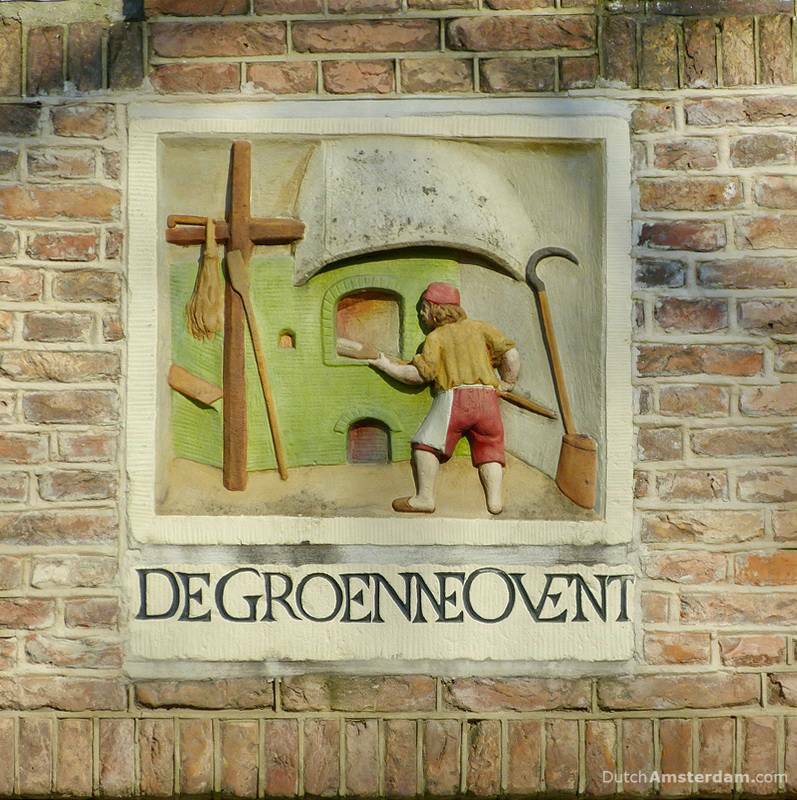 An interesting example of the urge to preserve the past is seen in Amsterdam’s many gable stones. These stones, of which there still are some 850 in Amsterdam, served both to decorate and identify a building. Many were used as early forms of advertising signs. 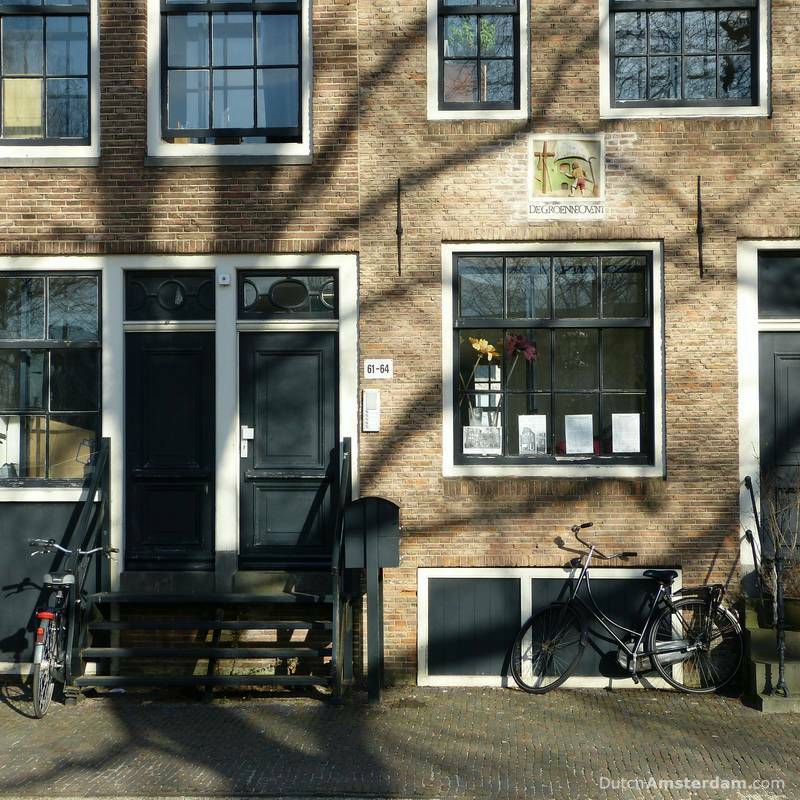 But since house numbers were not used in Amsterdam until 1795 (as decreed by the French rulers), gable stones served as address indications for everyone. This stone came from a house built in 1664 by baker Gerrit Barandsz in Kleine Kattenburgerstraat. Having survived the urban renewal project, the stone was rediscovered in 2007. 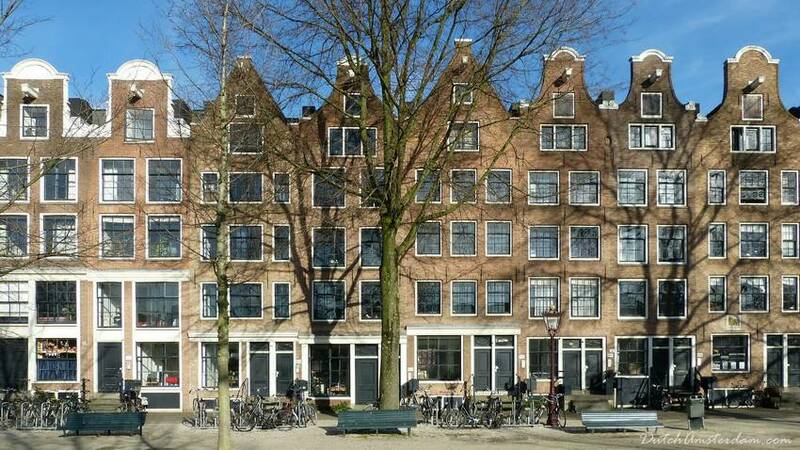 It was restored by VVAG (Friends of Amsterdam’s Gable Stones) and housing corporation De Key. In 2009 it was placed in Pieter Pals’ façade. Many gable stones found throughout Amsterdam have likewise been restored and placed in new locations. There’s more to be told about Kattenburg, particularly about the island’s connection to the navy. But that’s a topic for another day. Kattenburgerplein (red marker) is 1.7km from Amsterdam Central Station (orange marker) — a 21-minute walk along Prins Hendrikkade. From Central Station you can also get their by buses 22 or 48. After seeing Kattenburgerplein, continue along the thoroughfare (yellow line) for a pleasant walk.